Start Working with a Broker Today! How can we help get you on the water? We are determined to find the right vessel for you and your family. Our personalized service will exceed your expectations, and we will continue to work hard for you after the sale. Whether you are buying or selling, let us help you with your boat or yacht! Intracoastal Yacht Sales is a full service yacht dealer. We offer support, even after the sale, with our one-on-one training that is tailored to your specific vessel. These tailored training courses give you a personalized experience that surpasses the average captain’s license classes. "Hi Doug, Again, thank you and Robert for the successful sale of our Sea Sport. 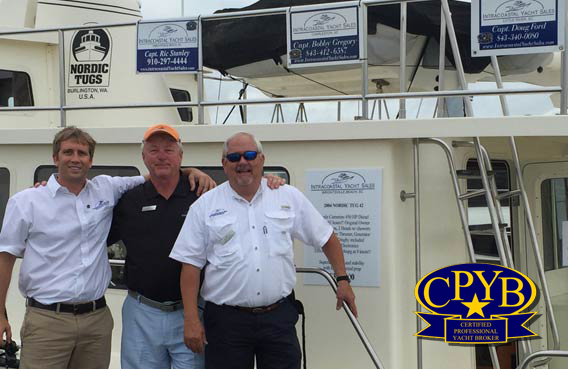 From the initial discussions of potential for selling our boat, the professional, open discussions of things to..."
"Captain Bobby, August 2018 You are a true professional……Honest, thorough, and knowledgeable. Your patience and experience saved us a lot of money and heartache..."
"Ric Stanley at Intracoastal Yacht Sales was a pleasure to work with. He was very honest and helpful with the sale and it went very smoothly." "Thank you Captain Ric for providing such valuable guidance and wisdom during the search for my first yacht. You were incredible! You steered me away from choices I initially thought were great, but..."